TransylvanianDutch: Do You Hear What I Hear? In the process of transcribing several family audiotapes, there have been several times I've rewound the tape and questioned what I had heard. What did I do? I asked Roget for help. Roget's Thesaurus, that is. I went to the section on Containers, and just started reading through the list, until I found a word that looked like it could sound like the word on the tape. It turned out to be Chiffonier. It was a completely new word to me, but now I knew what one was. I also struggled with the Hungarian and Romanian words they used for place names, foods, and other things. Those were harder to look up, but I figured many of them out. You'd think it would have occurred to me that when my grandfather, and his siblings began talking about their aunts, uncles, and cousins that the names I was writing down might be incorrect, not just because their memories were getting foggy, but because I was writing the names down wrong. I've also learned that another daughter of David Leib, who I had recorded as Celia Palmer, may really be Celia Pomerantz. My initial online searches have found some possibilities, but nothing certain. I'd like to find a descendant of Hani or Celia and share information. I know very little about my great grandfather's siblings. Footnote had a 50%-off CyberMonday sale, so I took the initiative and re-upped my subscription. One of the things I wanted to do was search their collection of City Directories, especially those for St. Louis and Chicago. They don't have any Chicago directories past 1923, but a few Guttmans appear in that year. 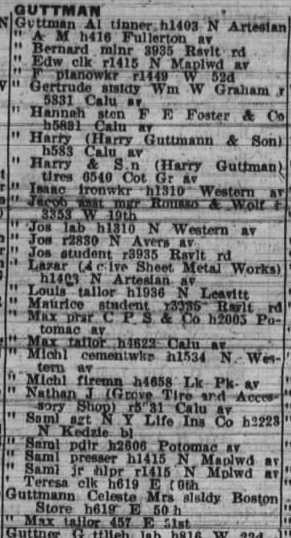 One thing this city directory clipping does is confirm the 1930 census in that Samuel Guttman's eldest son was named Samuel Jr. I had wondered if the census taker misheard, as this is an uncommon naming practice in European Jewish families, but it's clear Samuel and Samuel Jr. are both living at 1415 North Maplewood Avenue, along with Edward. Samuel and Edward are the two eldest children listed in the 1930 census for Samuel and Hani, so I am fairly certain this is the same family. I have no clue if any of the other Guttmans on the page are related. There's One in Every Family II: Home, sweet home!